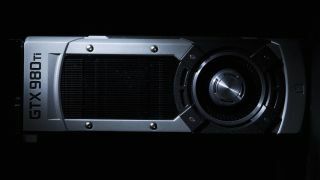 Nvidia has just introduced its latest flagship GPU, the GeForce GTX 980Ti, which has got both 4K gaming and virtual reality in its sights. The new Maxwell-based GPU packs in 6GB of video RAM and will deliver 4K gaming at a decent framerate - above 30 FPS - while boasting speeds of up to three times faster when compared to the GTX 680. But here's where things get really interesting: the GTX 980Ti has just over 90% of the CUDA core count of the prohibitively expensive Titan X, but comes in for less - $650 (around £425/AU$825) compared to the X's $1000. The X does have double the VRAM, but still, it's not a whole world of difference. We've already mentioned 4K gaming, but Nvidia's new baby is also designed to support virtual reality in a big way. We now know what the demands of the Oculus Rift will be, and the GTX 980Ti will certainly be up to the task (Oculus listed the GTX 970 as the minimum for the Rift). Nvidia's Maxwell architecture also supports the latest DirectX 12, while the new GPU is pretty damn energy efficient compared to something like the GTX 750; as Nvidia puts it, these second-gen Maxwell designs sip, not gulp, your power. Nvidia is also introducing a line of notebooks that will be powered by its G-Sync GPUs. For the uninitiated, G-Sync is Nvidia's solution for screen tearing - and a mighty effective one - that maintains refresh rate without costing you image quality of game performance. Starting June 1 you'll be able to get your hands on new notebooks from Asus, Gigabyte, MSI and Clevo, all flaunting the tech, with specs and pricing to be announced by the manufacturers.